Statesville, N.C. – As a hazy morning sun rises over the rural farm community surrounding North Iredell Middle School, the students take their seats and lift their MacBooks to start the school day. Soon, the glow of hundreds of screens illuminates each face in every classroom. Inside Skye Templeton’s seventh-grade Social Studies class, students are enthralled by online documents and videos about the casualties of World War II. Nearby, in Sara Sharpe’s sixth-grade math class, a small group of students works through computer drills covering ratios and percents. And, across the hallway, English and Language Arts teacher Lori Meyer expresses amazement at how much her eighth graders enjoyed doing their final project: a research paper and iMovie on the 1960s. With their MacBooks, students researched topics, wrote their papers, and submitted to their teacher via email. At North Iredell Middle School, about 60 miles north of Charlotte, teachers and students have leaped into the digital learning age with the distribution of more than 600 MacBook Air laptops to every student for school and home use. The laptop rollout at North Iredell is part of a $20-million federally funded plan by the Iredell-Statesville Schools District that will issue MacBooks to 11,300 students in nine middle schools and seven high schools. The federal grant will also fund the district’s conversion to a blended learning approach that combines traditional teaching with digital instruction. With the laptop program and the blended learning initiative, school officials are joining a nationwide movement intended to transform public education through the use of technology. To ensure success with their laptop plan, Iredell-Statesville officials consulted with the neighboring Mooresville Graded School District, whose digital conversion in 2009 emerged as a national model for building the 21st century digital school district. Last year, President Obama visited Mooresville to announce a new federal program to connect nearly all American schools to high-speed Internet. He praised Mooresville’s digital classrooms and urged school districts across the nation to follow their lead. Since Mooresville’s digital conversion began, the district has seen remarkable gains, including a rise in proficiency on state end-of-grade exams from 73 percent in 2008 to 89 percent in 2012. Graduation rates have also jumped from 71 percent in 2008 to 93 percent last year. While Mooresville has garnered national attention for tech advancements in a relatively small district of eight schools and 6,000 students, the Iredell-Statesville Schools District – with 36 schools and nearly 21,000 students – offers a more realistic portrait for America’s larger districts of the challenges involved in a digital conversion. 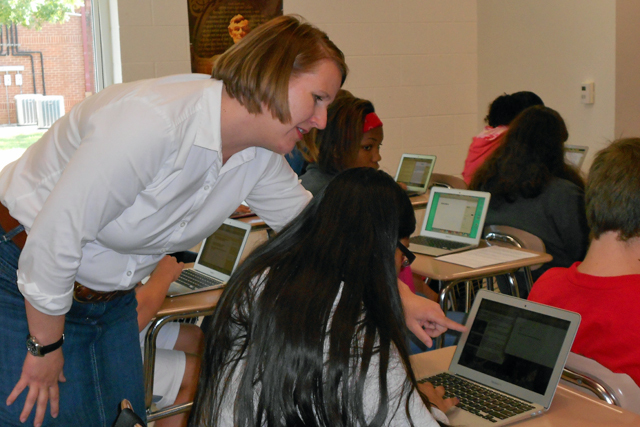 With the first phase of the laptop rollout completed at four Iredell County middle schools, principals and teachers say they have already seen a striking change in student engagement and recount stories of once struggling students whose grades have improved. But, their experience shows it’s not easy and that introducing technology in the classroom holds no guarantee that learning will improve. Though Mooresville is seen as a pioneer in digital education, its manageable size meant the laptop plan required less funding than the average U.S. school district would need. Mooresville also benefitted from a local education tax and received a $250,000 grant from Lowe’s Home Improvement. In the Iredell district, financing was a formidable hurdle and the digital conversion only became a reality due to the federal award. In addition, this North Carolina district’s plan involved intensive preparation, laptop logistics, and teacher training. Moreover, district leaders faced unexpected parent opposition, criticism from county officials on the “astronomical” cost of MacBooks, difficulty monitoring laptop use in classrooms and questions on long-term funding for the technology after the federal grant runs out in 2016. Located in the southern hub of NASCAR racing that encompasses a diverse mix of suburban country clubs and bucolic farm communities, the Iredell-Statesville Schools District serves more than 20,000 students. Nearly half are eligible for free- or reduced-price lunch, a measure of poverty. According to the district’s most recent enrollment figures, nearly 69 percent of students identify as white, 14 percent as black and 11 percent as Latino. In contrast to the Mooresville district, the countywide Iredell-Statesville district has reported significant student achievement gaps among black, Latino and limited-English students, said Melanie Taylor, associate superintendent of curriculum and instruction. In 2012-2013, only 47 percent of black students and 50 percent of Latino students in grades four through eight scored proficient on math and reading end-of-grade tests, compared to 78 percent of white students. In that same year, only 13 percent of black students and 22 percent of Latino students in 11th grade scored above average on the ACT, compared to 53 percent of white students. “We also see gaps with our gifted students not showing growth,” Taylor said. In past years, teachers and students in the Iredell-Statesville district similarly lagged behind in adopting digital resources into their daily coursework. Some teachers used the school computer lab for projects, yet found many students could not complete work at home. Each school also had two laptop carts shared by multiple teachers, but demand for the carts limited how much each class could do. Connectivity posed another problem, with students complaining that the school Internet was painfully slow. 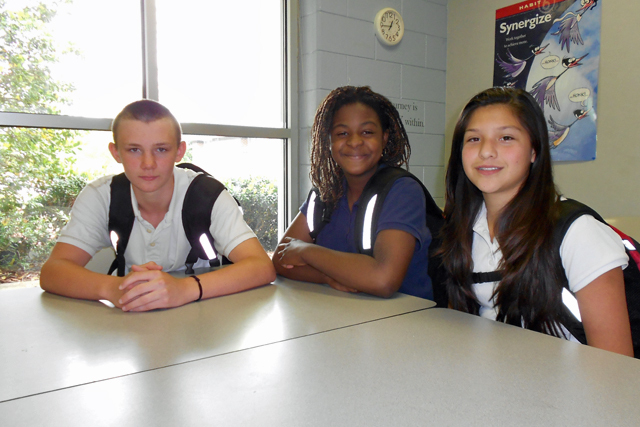 Almost immediately after the ISS District was awarded the $20 million Race to the Top-District grant in December 2012, school officials began planning for their digital conversion project, which they dubbed IMPACT (Innovative Methods for Personalizing Academics, Complemented by Technology). In developing teacher training, the Iredell district took a different approach than the Mooresville district, said Taylor. Instead of focusing on devices and software, Iredell emphasized blended learning and how to integrate digital instruction into the classroom. District officials consulted with Education Elements, a California-based company that assists school districts in implementing blended learning. After touring the district, the Education Elements team recommended different classroom design models that could be used by each school and also conducted a two-day workshop for principals, assistant principals, school instructional facilitators, and blended learning coaches. In September, before any MacBooks were distributed, the blended learning coaches began training teachers in their respective schools. Erin Walle, the coach at North Iredell Middle School, said early conversations centered on what is blended learning, how to form small groups or “stations” in the classroom, and creating digital lesson plans that center around the personal academic needs of each student. “Many reforms in education come and go, but using technology in the classroom…is here to stay and teachers need to embrace it,” Meyer said. Though school officials expected resistance from teachers, they were surprised when the Iredell County Board of Commissioners initially rejected the plan to spend $10 million on MacBooks and criticized them for not providing specifics on funding after the grant expires. The Commissioners ultimately approved the plan, on condition that the school district provides two updates a year and a meeting at the end of the second year to discuss future funding. This story is part of a Hechinger series examining the digital divide in American schools. Read more about how technology is changing education. Can high-poverty urban districts like Philadelphia close the digital divide? How can schools close the technology gap and how much will it cost? Several parents also voiced opposition to the digital project, saying they were uncomfortable with the idea of their children receiving their own laptops and venturing to unsafe places on the web. Earlier this year at East Iredell Middle School, about a month before the laptop distribution, Principal Jimmy Elliott held a parent meeting on the laptop plan and was caught off guard when some said they were against it. Elliott said parents were advised on monitoring their children when using laptops at home and instructing them on setting time limits and blocking individual sites. Parents were required to pay a $20 technology usage fee for each student receiving a laptop. In September, the fee will rise to $50, though low-income families can request a hardship fee waiver. Reflecting on the opposition, Elliott said he had underestimated the importance of explaining to parents how technology can impact learning. 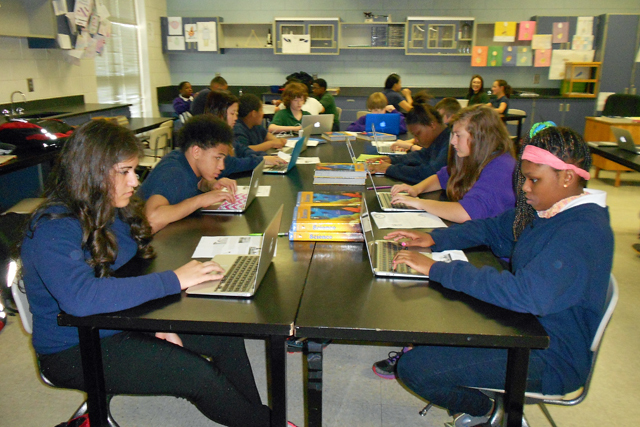 Across the four middle schools where students have already received laptops, teachers have implemented blended learning in their classrooms in several different forms, depending on the subject matter and their students. At Mt. Mourne International Baccalaureate Middle School, Spanish teacher Victoria Principe divides her class into three groups. Students in one group are assigned to conjugate verbs online, using “conjuguemos.com” website. Another group busily types as they translate a handout on Costa Rica. Principe sits with a smaller group engaged in Spanish conversation. At East Iredell Middle School, Michell Fandino, 13, is a digital learning success story. For Michell, whose parents immigrated to North Carolina from Colombia, online instruction has led to better grades and a new outlook on school. The secret? Michell said the digital drills on the MobyMax math program allowed her to review problems independently — in class and at home — until she understood them. “Maybe a tutor would have helped. But, when I’m at the computer, I’m doing it because I want to do it,” she said. Another East Iredell seventh grade student, Andrew Johnson, said he prefers the laptop to paper and pen. One teacher noted that before the laptops were issued, Andrew rarely turned in homework assignments. Now, he emails all his work and has boosted his average. However, new problems have surfaced during the digital conversion. Several teachers said students must be constantly monitored while on their devices in class to ensure minds and fingers are not wandering to games, music, or social media. Bill Brown, blended learning coach at East Iredell Middle School, said teachers need to find a delicate balance between independent learning and digital discipline. As more school districts adopt student laptop plans, connectivity issues will prove to be costly and complex. In Iredell, the district faced an Internet connection in need of upgrade and a weak infrastructure. Blattner said the district replaced out-of-date wiring with a much faster fiber connection using funding from a federal subsidy known as the E-rate program, which is at the center of Obama’s plan to expand high-speed Internet to more schools. But a more difficult task is bridging the significant digital divide that exists in the ISS district. Across the sprawling district that includes luxury homes, farmhouses and trailers, some students from high-income families have easy access to computers and technology at home. Other, low-income students live in rural areas with no Internet, cable or even cell phone service due to the contours of the land. Blattner said the district is hoping to start discussions with local cable and telecom Internet providers on partnerships to provide students with Internet and Wi-Fi access at home. At the same time, the E-rate program only supports the purchase of wiring and other equipment to connect schools to the Internet. It does not fund the purchase of computers and laptops, pay for their maintenance or support their technology staff. Superintendent Brady Johnson said talks are underway on how the district will sustain the technology budget after the Race to the Top grant runs out. Iredell district leaders estimate the technology expenses will amount to approximately 8 percent of their $175 million budget, or about $14 million. In Iredell, many educators are convinced a change has already occurred. For some students, the simple act of having their own laptop has led to a deeper sense of ownership over their assignments and education, said East Iredell science teacher Angela Trusler. Before East Iredell seventh grader Iyana James received her laptop, she said she never used her home computer for school. Now, with her own personal device, she sees it as her tool to better understand the subjects that she found more difficult like social studies and science. When asked how the laptop has helped her in school, she starts to answer, then has a better idea. Reproduction of this story is not permitted.